Today in our Decatur Smiles blog we will highlight some of the simple things you can do with your toothbrush to keep your mouth as clean and healthy as possible. One of the most important habits Decatur residents can form is to always allow their toothbrush to completely air dry between uses. 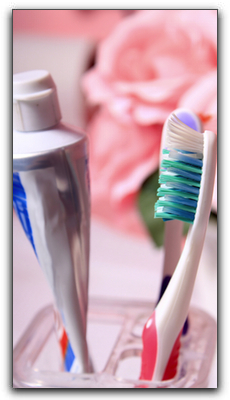 The best way to let the toothbrush air dry is by placing it in a toothbrush holder on the counter with the bristles pointing up. This method of storage is much better than sticking it away in a drawer since it will take longer to dry in there. Also, when you travel away from the North Athens, East Mooresville, or South Cullman area, make sure your toothbrush is dry before you seal it away in a travel container. A good strategy for Decatur residents to make sure their toothbrush has ample time to dry is to buy two toothbrushes at your Decatur drugstore. Then alternate between the two so each has time to fully dry out between uses. And Decatur dental patients should remember to replace their toothbrush (or toothbrushes) every 3-4 months, or sooner if they’ve had a cold! We are currently accepting new Decatur patients and the comprehensive staff here would be happy to answer any questions you have about teeth whitening, veneers, bonding, or other cosmetic dentistry procedures. Make an appointment today.